Right, before any of you ask: yes, I’ve bought some Ray-Ban Aviators. And yes, I’ve bought a new trucker baseball cap. Because this is my new long-termer. 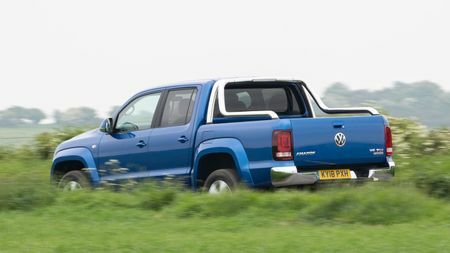 It’s a Volkswagen Amarok and I’m playing up to as many pick-up truck stereotypes as I can. Yee-haw. In all seriousness though, why an Amarok? Well, I want to examine a recent trend that’s increasingly seen people opt for a pick-up as a lifestyle vehicle, rather than as a working truck. I don’t own a landscape gardening company or transport pallets and shovels between work sites, but more and more manufacturers are starting to cater for the general public, offering trucks with mod-cons and luxury features, as an alternative to an SUV. If you’re a business user, you can take advantage of some distinctly preferable Benefit-in-Kind tax rates on trucks compared to cars. Unlike the sliding scale of tax for cars, which varies depending on their CO2 emissions, the rate for pick-ups is fixed. All of this means that the modern pick-up truck is considerably more comfortable and desirable than those of a decade or so ago. I mean, even Mercedes-Benz do one now. I want to find out what benefits come with owning a big truck, and what the drawbacks are too. I’ve gone for the Highline trim level of Amarok, and under the bonnet is a 224 horsepower, 3.0-litre diesel V6. It’s got four-wheel drive and an eight-speed gearbox. I’ve opted for what I think is the best colour – Ravenna Blue – and I’ve opted to spend a bit extra on lashings of chrome, because let’s face it, a dirty great, metallic blue pick-up truck isn’t exactly subtle. I’m embracing the brashness. So, I’ve added the chrome styling pack for just over £1,100, and I’ve spent around £1,200 on the ergoComfort front seats, which adjust in 14 different ways. All electrically, of course. Other major options I’ve specced include the Navigation Tech Pack (£1,146), which includes the Discover Media navigation system, controlled via a touchscreen in the centre, as well as multi-function display between the speedo and rev counter, and some power folding wing mirrors. Bearing in the mind the size of the truck, I suspect those will be useful, and I hope the navi system brings the infotainment options up to SUV levels. It’s got Apple CarPlay and everything. I’ve also gone for some front fog lights (£84), and a protective coating for the loading deck (£810) to stop it getting chewed up by whatever I end up throwing into it. Oh, and a towbar (£348). I’m not planning to tow anything, but I suspect having one will keep resale values up. And maybe I can use it for a bike rack in the future. I’ve spent the last month using the Amarok regularly, while jumping in and out of other cars in my role as Auto Trader’s senior road tester. So I’m now in a good position to muse on what I like, and what I’m not so keen on, so far. First, let’s talk about the interior. Is it up to SUV levels? Well no, not quite. In fact, there are even better-quality interiors in other pick-ups, such as SsangYong’s new Musso. But the Amarok isn’t spartan or uncomfortable. If you’re lining it up next to the latest Touareg then it’s going to look a bit basic and dated, but taken on its own merits it’s entirely acceptable. 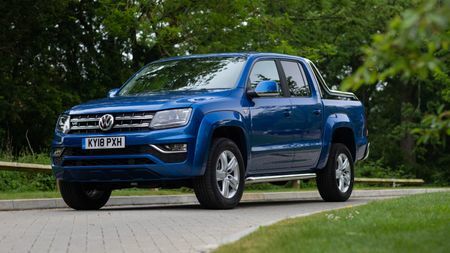 Some of the plastics aren’t of the highest, premium quality that you’d find in other Volkswagens that cost the thick end of £40k, but hey – it’s a pick-up truck. It’s got to keep a little of the hose-down feel. The seats are clad in cloth and, having shelled out an extra grand on the ergoComfort electric chairs, they’re perfectly comfortable, even on long motorway slogs. 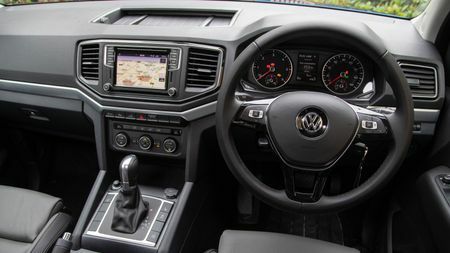 The infotainment isn’t as slick to look at as some of VW’s latest piano-black units – it’s more akin to units you’d see in cars five years or so ago – but I actually prefer the way it works, with proper buttons rather than touch-sensitive panels. The sat-nav itself isn’t a patch on the latest apps found on mobile phones – Waze being my app of choice – but the fact that the system has Apple CarPlay is a big plus, making it super simple to bring in audio content and calls from my iPhone. I haven’t yet had cause to put anyone in the rear seats, but there’s plenty of room for three adults back there. Frankly, it’s just as well I don’t have friends to carry, as I’ve been using the rear seats for luggage storage. It’s all very well having a huge load deck at the back, but there’s none of the convenience features, such as luggage hooks, that you’ll find in most modern SUVs. If I put the shopping bags in the back, there would be oranges and milk strewn everywhere by the time I get home. There’s also the concern that the bed is open to the elements, even if I do manage to secure stuff. To be fair, there are some hooks to which I could attach some bungee cords in an effort to tie the shopping down, so I’ll look into that. But I think I’ll need to investigate acquiring some kind of load cover should the rains come. 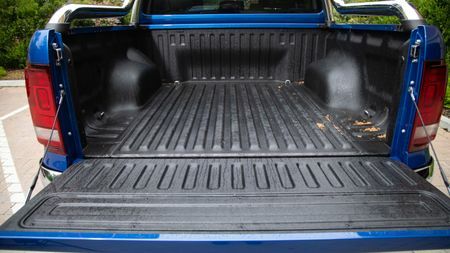 I spoke last month about the lack of practicality of the Amarok’s load deck, what with it not having a cover and all. 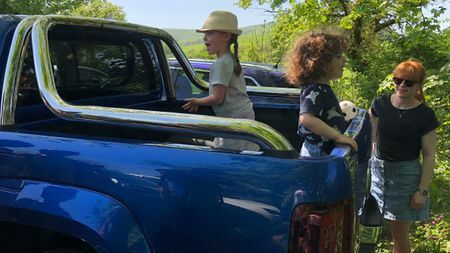 It didn’t prove an issue for my niece and nephew, who on their first viewing of the truck clambered into the back and treated it as a playground. But it meant that more often than not, I eschewed the truck’s cargo area in favour of the rear seats for bags, shopping and other detritus. But that might be about to change. 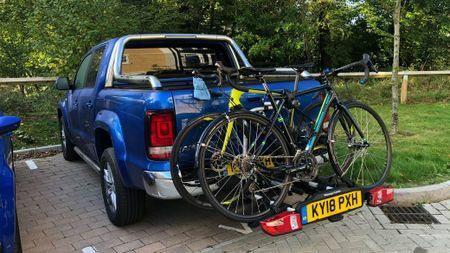 The Amarok took a quick trip back to Volkswagen, and returned resplendent with a new Roll-N-Lock load cover, which locks to the tailgate, and also a three-bike rack that fixes to the towing hook, and folds down into a handy bag. I have high hopes for the bike rack, as trying to put a bike in the load deck means it just skitters about all over the place. At the time of writing I’ve not yet had a chance to try it out, but the load cover is already a big improvement. For starters, it stops leaves and other rubbish gathering in the back whenever it’s windy, and it now means I have somewhere secure to keep stuff. It doesn’t stop the issue of stuff sliding around under cornering, but at least now I can’t see it. It wasn’t cheap at £1300 excluding VAT, but it’s something I wish I’d specced in the first place. The load cover and bike rack arrival does mean that my key ring is getting rather chunky though. Now as well as the usual key, I have a smaller key to lock the bike rack in place, and another for the latch at the top of the load cover. Still, I have big pockets. It’s fine. I’ve now got used to the foibles of driving a pick-up truck, in comparison to an SUV. In a lot of ways, it’s similar. You sit high on the road, with a commanding presence over other road users, which has plenty of appeal. 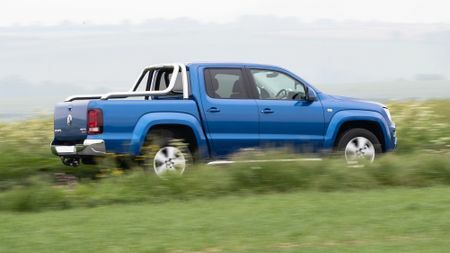 The Amarok’s suspension is very unsophisticated though, with leaf springs at the back rather than traditional dampers, and I was concerned that it would consequently handle like a big old barge. It’s definitely not as sophisticated as a modern SUV, with some bumping about, but it’s all nicely damped thanks in some part to all the air in the big, chunky tyres. The result is that small bumps in the road are felt more than in something with a more sophisticated chassis, but on the plus side, massive potholes feel… well, the same. There’s little spectrum of how bumpy things get. There’s just bumps, all of which are entirely tolerable. Handling isn’t what you’d call sharp, and the steering is slower than an SUV and requires more wheel-turning to change direction, but there’s none of the pitching and rolling that I feared. Engine-wise, it’s pretty impressive. There’s a big 3.0-litre V6 under the bonnet, making 224 horsepower and plenty of torque. Gears are shifted automatically by an eight-speed gearbox, and it makes for zippy progress from standstill. 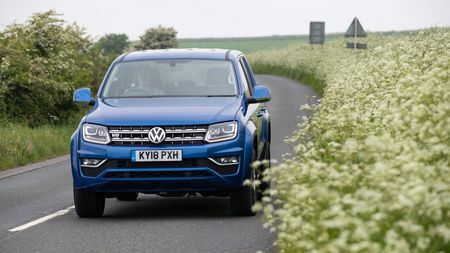 If you’re used to driving a car, you’ll find the gears shift very early – I’m in fifth by 30mph – but it means the Amarok is far from sluggish. Indeed, having driven another pick-up truck – SsangYong’s new Musso – this month, I was struck by just how much grunt my Amarok has in comparison. The only thing that brings me slightly back to earth is the fuel consumption. A full tank costs me around £90, and I’ve returned an average of 34mpg so far with mainly motorway driving. As soon as I venture into urban environs, that drops to mid-20s. But aside from the sting at the pumps, I’m glad of the performance. While I’ve enjoyed my time with the Amarok thus far, it had occurred to me that I hadn’t actually done much picking-up with my pick-up truck. Well, this month, that changed. My colleague Ivan Aistrop swiped it for a few days to transport an unusual piece of cargo. Over to him. “Know what this is? Why, it’s the detachable hard top from a 2003 Toyota MR2 Roadster of course. What else would it be? “Turns out, one of these is quite difficult to transport when you don’t have a 2003 Toyota MR2 Roadster to put it on, as I’ve had to SORN the car in question. 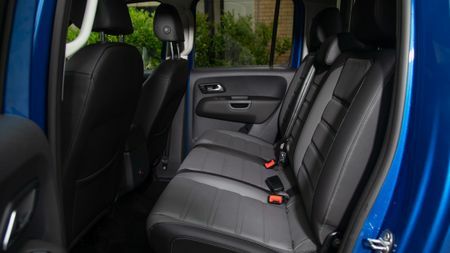 Being 120cm at its narrowest point, and more than 140cm at its widest, there aren’t many cars - be it an estate, SUV or MPV – that have a load area wide enough to accommodate it. And as a result, the Amarok came in very handy. “Yes, the cargo was too wide to fit between the rear wheelarches that protrude into the load bed, but there was still enough room for it to rest on top of the arches while fitting beneath the roll cover, keeping it tethered and secure. In fact, the fit was so snug that the Amarok was probably better for the job than a van would’ve been. I’ve also had a chance to try out the new bike rack for the first time to carry my wife’s bike. It’s a serious bit of kit, and the first tow hook-mounted rack I’ve used. It handily folds down into a carrying case, which I keep safely locked up under the roll cover. Assembling it and mounting it to the tow hook was a bit of a challenge, akin to building Ikea furniture, but after about five minutes I’d managed to fold out the various folding bits, mount it and plug in the electric connection so that the light board worked. I did find that my wife’s bike, which has flared drop handlebars, rubs on the tailgate if I put it in the closest of the three bike slots, so instead mounted it in the middle slot with no issues at all. 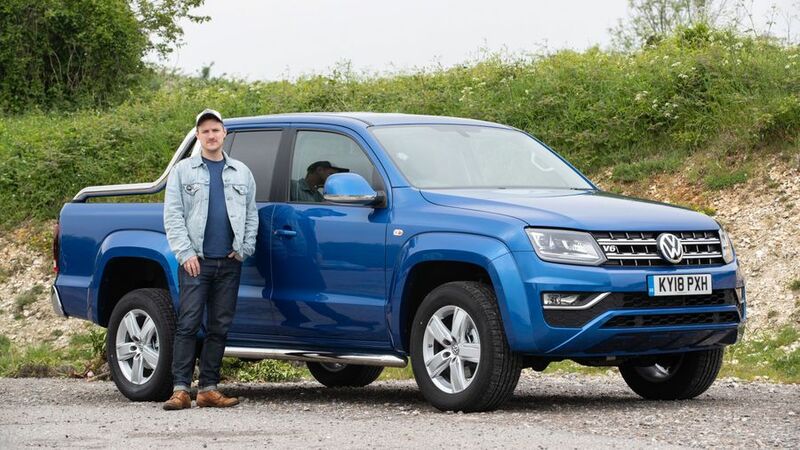 The only downside is that it makes the already-long Amarok even longer, which could make for some interesting parking manoeuvres in the future. 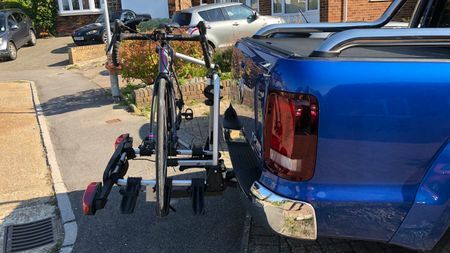 As mentioned last month, the Amarok now has a resident three-bike rack and this month I tried to use it to carry three of my bikes at once. I failed, but as it turns out, that’s because I’m an idiot, rather than because the bike rack isn’t capable. With winter approaching I was taking my bikes to be given their annual service. Bright and early one morning I unfurled the rack from its bag, attached it to the tow hook and popped the three bikes on. The problem came with the securing of the bikes. The rack has two arms that swing up from the back and clamp around the bikes’ top tubes. There’s a short one and a long one permanently attached, and a third, even shorter one that kicks around loose in the bag. My mistake was to assume that the shortest clamp was for the nearest bike. As it turns out, it’s a bridging clamp from bike-to-bike, not from rack-to-bike. Of course, I didn’t realise this until several hours after I’d sworn, given up, and only taken two bikes instead of three. Other than that, I realised this month that aside from Ivan’s Toyota roof mentioned last month, and the bike rack, I’ve not actually had much call to use the load bed. The problem is, compared with a boot, it’s not actually that practical. Sure, it’s big, which is great on occasion. But unless you have big, heavy items that won’t slide around all over the place, it’s hard to justify chucking shopping or smaller things in, as you fear they’ll skitter over the metal surface, bash into the sides and generally get battered. At least in a boot, it’s lined with soft material. Admittedly, I don’t have kids, and I suspect that would change things. 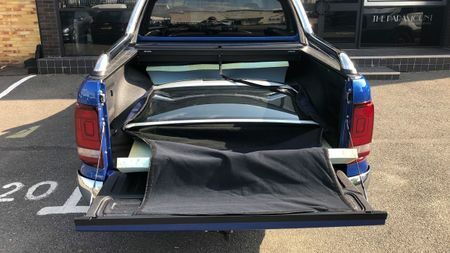 Typically I use the back footwells for large shopping bags and the like, but if there were small rear occupants – and assorted pushchairs, prams, scooters or plastic toys – then the large rear space would be much more usable. And so my Volkswagen Amarok has headed off to the great building site in the sky. Or rather, Volkswagen have come to pick it up and sell it to someone else. My six months of pick-up life are over. So what have I learned? Firstly, it’s entirely possible to live with a pick-up instead of a car for everyday life, but there are a few compromises that you’ll need to consider before you reach for the trucker cap. The practicality will suit different people in different ways, for better or worse, and the big, open “boot” space in the back won’t be for everyone. I ended up using the rear seats to store shopping far more than I used the load bed, simply because stuff got slung around. Having said that, the large rear space was a useful thing to have on occasions when bigger stuff needed shifting, although that only happened two or three times during the six months. The load cover was a must-have extra, keeping the weather and assorted detritus out, while also keeping the contents safe. Interior quality in the Amarok isn’t as plush as a regular car, but it’s far from spartan or uncomfortable. We popped a few choice upgrades in ours, including upgraded seats and infotainment system. The heated seats were particularly welcome as the summer faded, and long journeys were no problem in terms of comfort or noise. Performance was surprisingly perky, and I’d recommend the 3.0-litre diesel V6 engine. Newer Amaroks have a different power output – either 204 or 258 horsepower, rather than the 224 horsepower version that I’ve been driving – but I’d be surprised if the performance is radically different in either. The automatic gearbox works well, and made for zippy, smooth progress. The slow steering takes some time to adjust to, but adjust to it you will, and while the ride quality and handling isn’t quite as smooth as an SUV of the same price, it’s entirely acceptable. Fuel economy was pretty horrendous. Most of my driving was on motorways, which is more economical than urban driving, and I just about scraped a 32mpg average, which isn’t brilliant compared to a car. More so than any logical, quantifiable advantages, the pleasure for me in driving a truck has been emotional. It’s just fun to yomp around in a vehicle that looks like the toys I used to play with as a kid. It’s up there with the desire to drive a train or an articulated lorry or a big yellow crane, and jumping into it would often put a smile on my face. All this means that unless you’re absolutely wedded to the idea of truckin’ around, it’s only worth doing if the maths add up and a truck’s strengths fits in with your needs. Should the tax savings make up for the lack of refinement and extra fuel bills, then go for it. The Amarok has been a fun vehicle to drive, and I’ll miss it.